A poor weather forecast, a late start to the weekend due to being on call til 9am Saturday morning - well, it made sense to go and do some catch up hills for Allison, who was currently lagging 32 behind myself. 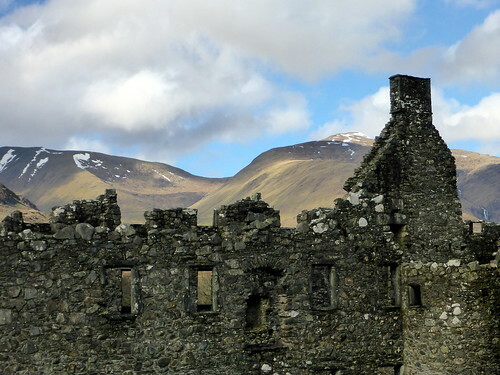 We thought we'd try and get the ill-fated pair of Ben More & Stobinien tackled - every time before now we've planned to do them something's stopped it - most recently crashing my car the night before we were last due to attempt them. 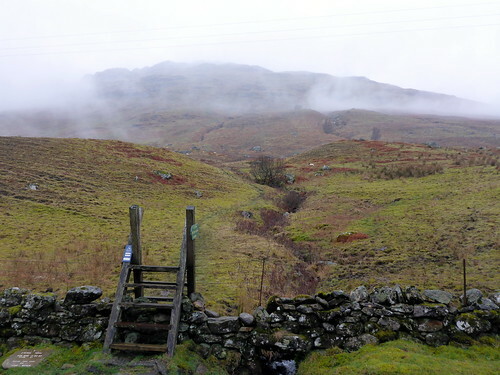 And since bad weather had prevented Ben Tulichean being completed along with Cruach Ardrain at the turn of the year, it seemed sensible to add that onto the others. 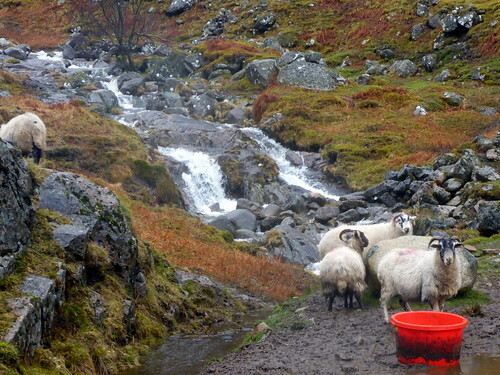 So a route from Inverlochlarig was drawn up. I was phoned by work on multiple occasions overnight on friday, so wasn't at my freshest when we headed off on saturday morning. 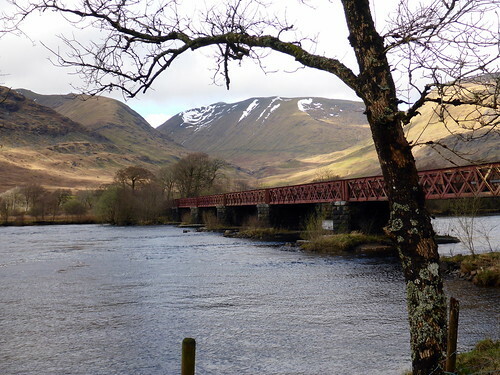 Up to Lochearn and along the pretty, but narrow road to Balquhidder, somewhere I've not been before. Lot of f fishermen out by the roadside, lots of "No Camping, No Fishing, No Parking" signs too. Twisted and turned our way to the parking / picnic spot at the end of the road and parked beside one other car of lunatics going into the hills this weekend - we saw a small group heading off for Tulichean as we arrived. 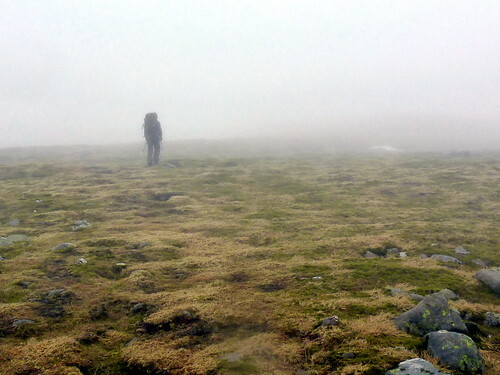 Low mist sat at around 500m, didn't look like views would be happening today. The ascent of Stobinien from here is brutal and straightforward - out of the parking spot and straight up the steep grassy hillside of Leathan nam Fiadh for about 400m then a bit of respite as the gradient eases over Stob Invercarnaig. Bit of smirry rain and clag meant no views. Pressing on we came to some snow at around the 1000m mark, but soft sugary stuff in the main. It did get a bit icy underneath the snow on the higher reached of Stob an Coire Lochan and I decided to put my crampons on for added security. 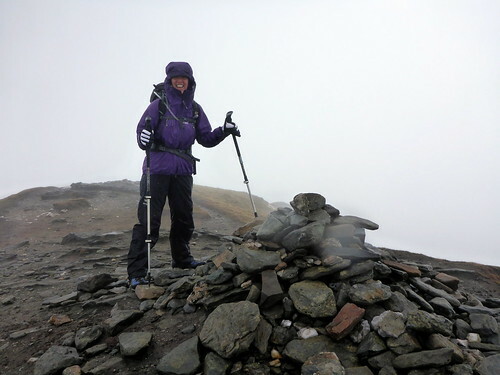 The temperature had started off very mild at the bottom of the hill, but it was wet and windy with a substantial wind chill at the dainty summit of Stobinien, requiring a bit of wrapping up. 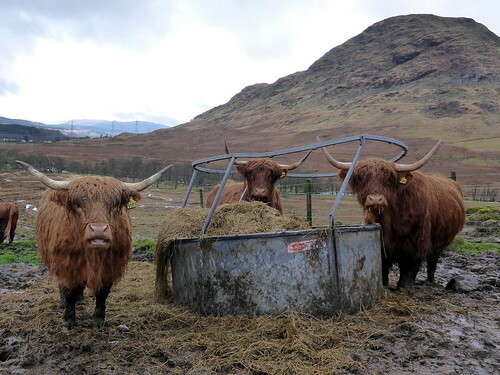 Stopped for something to eat, no views to enjoy and down the steepish slopes to Bealach eadar dha Beinn. Last time I'd been here it was a perfect winter's day with crisp crunchy snow and miles of visibility (and I'd forgotten my camera) but today most pf the snow was gone under 1000m and I didn't need my camera. 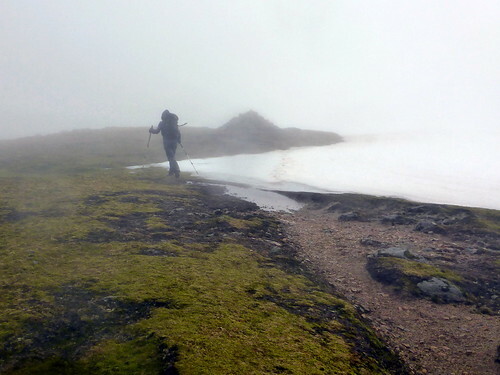 No sooner had we got to the bottom of the bealach than it was time to start going uphill again. 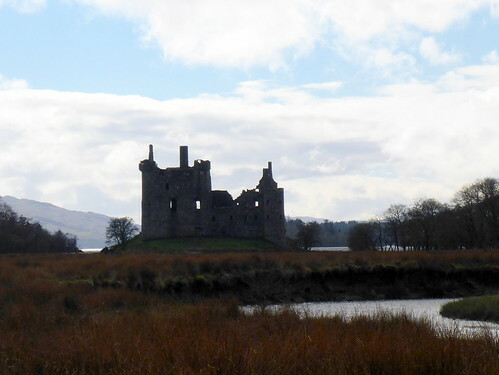 For a very brief period the sun came out and there was even blue sky - didn't last however. Powering up the path to the top of More, we again encountered snow after 1000m, deep in places but generally easy to skirt round. Sick kid was able to clasp the trig point and acknowledge that she'd eventually made it. 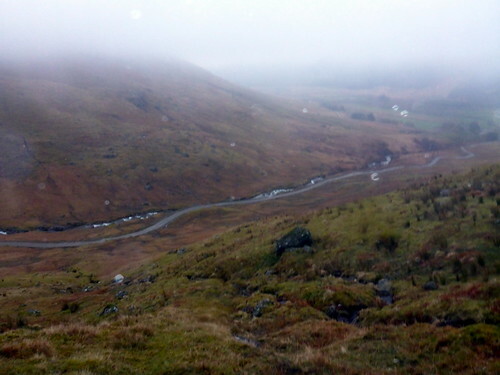 Back down to the bealach and then down the slippery wet grassy slopes to the glen. 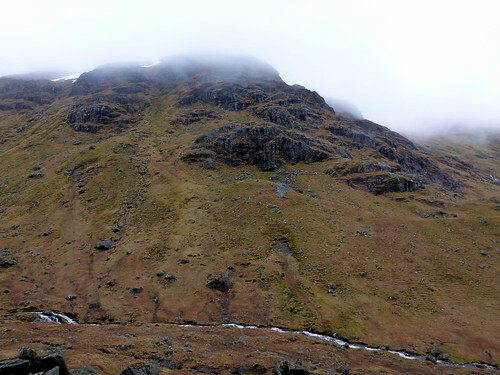 We made a trail in the general direction of the 497 spot height with the view of crossing the river and contouring along the side of Cruach Ardrain til we could climb up to Tulichean. 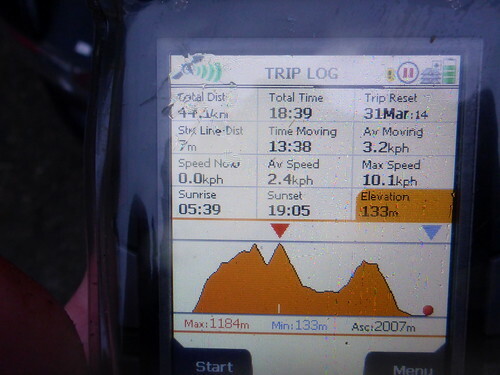 Although it felt like we were gaining height as we went along, the GPS indicated that we were simply staying at around 500m while the valley floor descended. 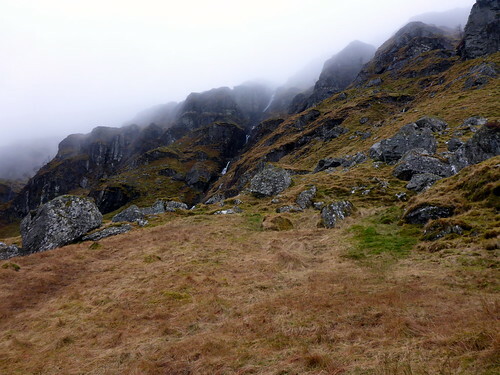 Looking up at the hillsides there were impressive torrents of streams swollen with snow melt coursing down the hillside and foreboding mist clag crags. 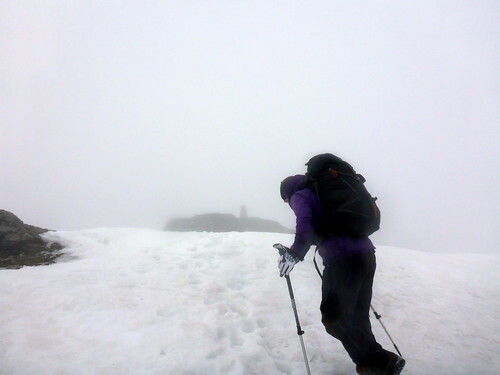 Eventually it was time to turn more steeply uphill - with considerable surprise we encountered lots of snow from around 650m. After our experience on Stobinien/More I hadn't reckoned we'd get much snow on Tulichean at all, being a sub-1000m summit, but we were on the north facing aspect this time. Deep old snow, some cracks visible and Sick Kid uneasy in case of avalanche. Avoiding the biggest stretches of snow where possible we finally got up to the path along at the 825m point and followed this to the small summit cairn. I remembered the last time I was up here, with my dog, nestling into my long beard. Always poignant to do a hill that I'd previously climbed with Finn. Anyway, we didn't linger, as it was now around 5pm and set off south, following the good path. I didn't have a map for the final part of the route, and had drawn a rather sketchy line on the GPS planner - well there would be a good path, wouldn't there? Unfortunately it petered out in the deeper grass and I thought we should be heading east - this brought us to a band of snow and no footprints. Looking down were steep crags and the probability of cornices. 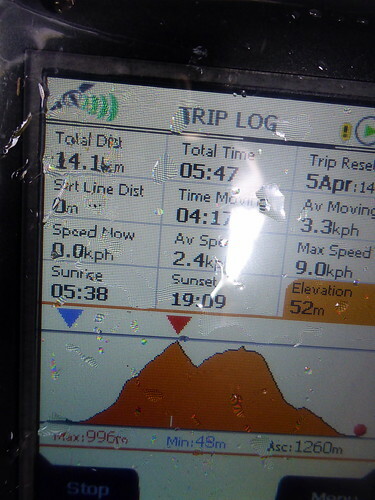 Damn - why did I not get a proper map - the small screen of the GPS map really isn't enough in these conditions. After a minor panic we decided to retrace our steps to where we last saw the path and look around for its continuation - eventually found it and with a sigh of relief followed off again. 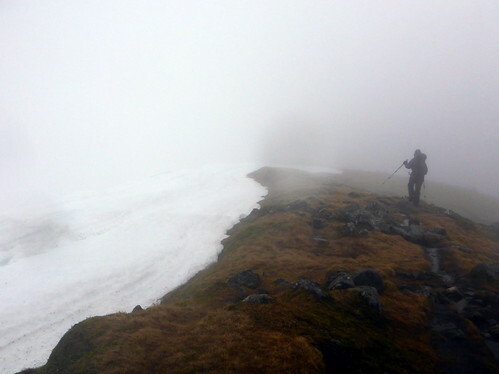 The path managed to avoid most of the snow, although was slippery and steep in places. 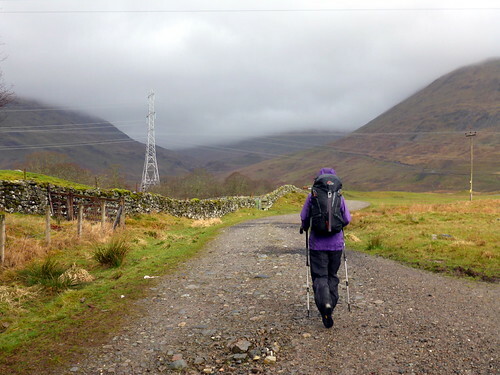 After a longer time than I'd reckoned we began to see the track beside the river and another 30 minutes took us down to it - from there it was an easy march along the road, passing through the farm buildings until we returned to the car. A long day, but 3 more hills doen for SK. 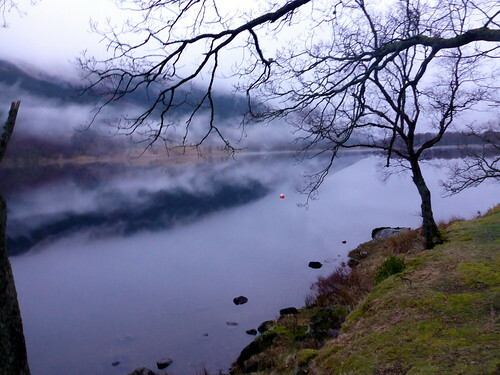 Driving back along the road the mist hung motionless above a mirrored surfaced Loch Voil - very pretty. 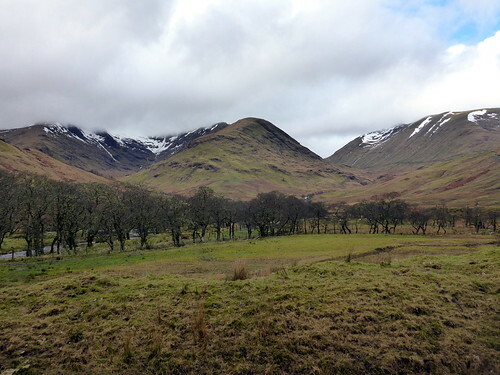 We'd decided to head to Braes of Balquhidder campsite for the night and arrived just as the light was fading. £8 was a very reasonable pitching price, although the tent area we chose was in the middle of a lot of static vans which were parked very close together. Being the Easter holidays, lots of kids up, satellite TVs going, not quite the quiet we'd had last week beside the Fannaichs. However, it was an OK place, apart from the owl that was doing a bit of free-form hooting for much of the evening. 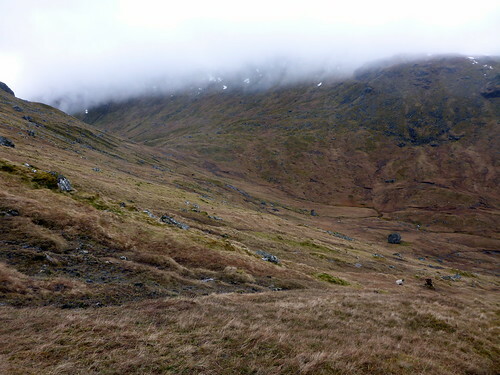 Once we'd got to the top of the steep section it's a gentle if boggy breeze along to the top of Eunaich. 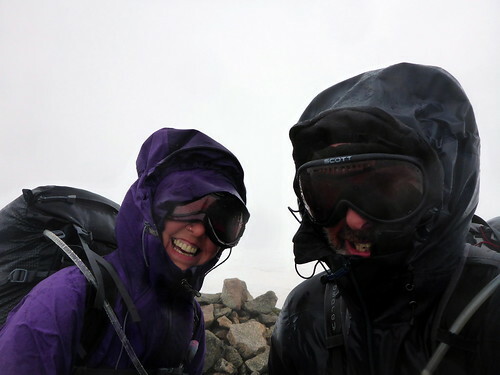 Like yesterday it got a lot colder in the wind as we gained height and it was a case of belay jacket and dachstein mitts when we stopped for an early lunch just down from the summit, trying to eek a little shelter from behind a largish stone. Rain was now heavier, and high humidity made for claggy glasses - always a nightmare. 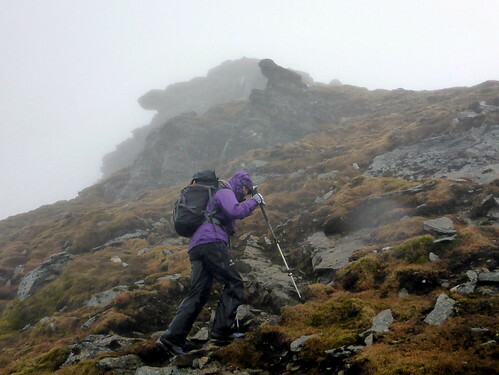 We headed down to the larig lanachain, more of a drop in height than I remembered - another 250m biting the dust before pressing on upwards for Beinn a'Chochuill. 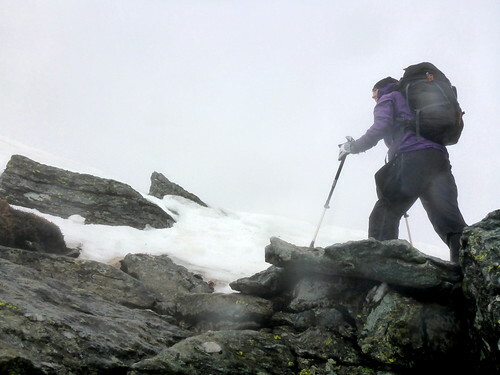 There was still a good amount of snow on the north side of the ridge, with hefty cornices, but poor visibility prevented any other assessment of the scenery. 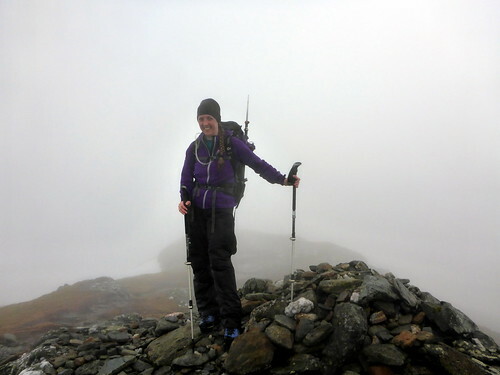 I had hoped to see over to Ben Cruachan from here, but not today As we reached the 896 point, the wind got up significantly and I did worry a little about how safe it would be up at the highest point on the ridge. But it isn't really that narrow and there was no need for fear. Spotted the pyramidal cairn, then headed back, going down the southern path back towards the track. This was very slippy and in places very windy too - SK and I were each blown over within a couple of minutes, where the wind id funneled between BaC and Stob Diamh, which was just visible through the clag as a white topped hulking ridge. Back on the main track and the weather starts to clear - we can not only see down towards Kilchurn Castle, but we can also see something of where we've been...Heading back through the cattle we enjoy some sunshine, which helps a bit to dry out the waterproofs before se have to get back into the car. 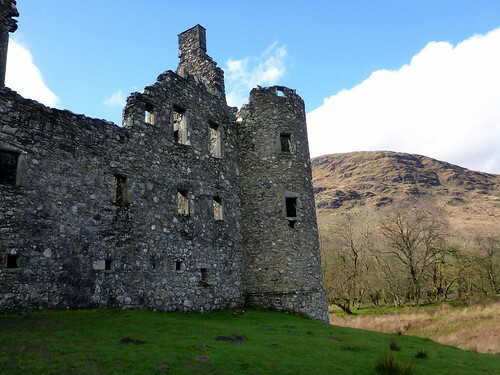 On the way home we decide to pay a visit to the Castle - home to the Campbells of Orchy and a right devious bunch if all things be believed, especially "Slippery John" From the castle we get good views of the hills we've just climbed in clag - looks like we should have gone up an hour or so later. 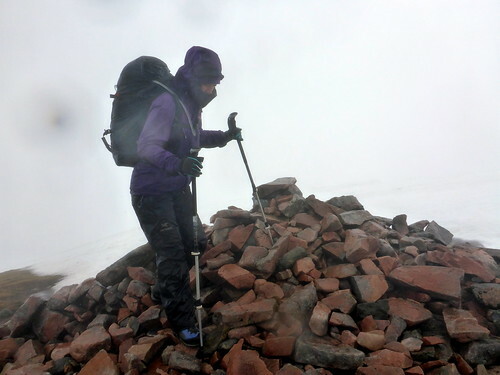 Aye, wasn't the best bagging weather this weekend..
Good going getting all those hills bagged for SK.. Thats dedication for you! 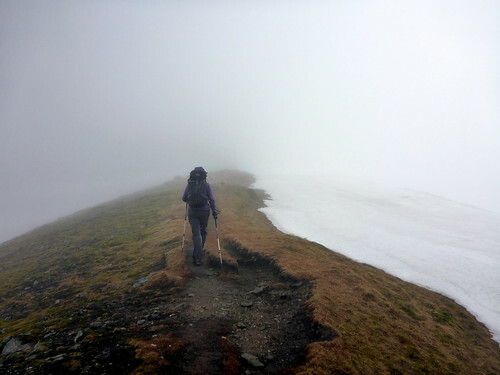 We decided against Stob Binnein on Saturday after encountering snow on the lower Ben Challum on Friday. Looks like we would have been ok. Saturday wasnt too bad weather wise on our trio from Glen Falloch but Sunday was pretty grim. 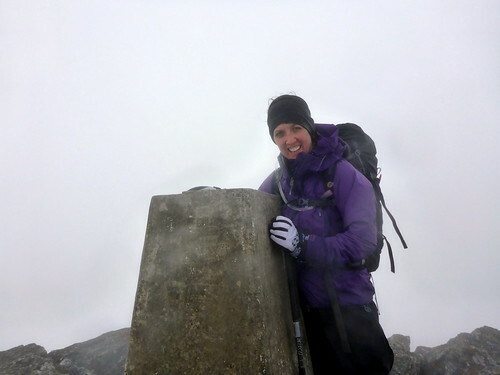 We got the same strong wind on Ben Chonzie. Ceaser you've just broke my heart!